The Alchemist was one of the books I was least interested in reading when taking up the book. It was bought by my brother an you see I wanted to read the other book, The Murder on the Orient Express but then I finally gave it a second thought and I started reading it just because it has been best seller. Plot: Santiago a shepherd in Andalusia has a recurrent dream. A dream which tells that if he went to the Pyramids of Giza he would find his treasure. Santiago goes to a near by town, and there he meets a Gypsy women who interprets his dream. Then at a nearby plaza of the town he comes across a an old king. He encourages him to follow his dream and gives him two stones which will allow him to interpret the Omens. Santiago reaches the Port of Tanger, where his journey begins from. He is looted by a person there. Then he works for a crystal merchant earns the money and goes to pursue his dream. A long journey to the Oasis in Egypt is followed by an encounter with the Alchemist. I've told a lot about the plot but believe me is just half of what the story is. This 150 pages book is story of a lifetime of Santiago and his dream. Paulo Coehlo has his own style writing. Any other writer would have concentrated more and more on his treasure but Coehlo has something more important and something which keeps a lasting effect. He concentrates on the things he learn during his journey and thats what I like about it. Fluent and Constant in its speed you never wish to leave the book. I've also read it faster. One of the most important thing a book needs to be capable of is the connection it builds between the user and the book. Paulo Coehlo does it exceptionally well, you see through the book into the world of Santiago and thats what a good book has to do. All in all, I'm completely impressed with the book. I would have regretted it, if I hadn't read it now. A book to be remembered for ages. We've heard of people trying variations with the bat since the game has evolved. In the early days a bat more like a hockey stick was used to play the game. It gradually changed to the bat we use today. Later in the 20th century Dennis Lillee played with an 'Aluminium Bat'. No problems with that but the ball, it weared off. Getting the batsmen to hit away from the sweet spot and get them cought was one of the important techniques used by the bowlers. This was the only way to restrict the batting team to a respectible total. We saw it get vanquished for the first time in commercial television when Mathew Hayden used the 'Mongoose' bat against the Daredevils in IPL 3. Sunil Gavaskar the legendary Indian Batsman feels there is no problem with the bat but he doesn't understand why it is called the 'Mongoose Bat' this is the queastion in mind of many people. Well, Mongoose is just the name of the company which makes cricket bats. 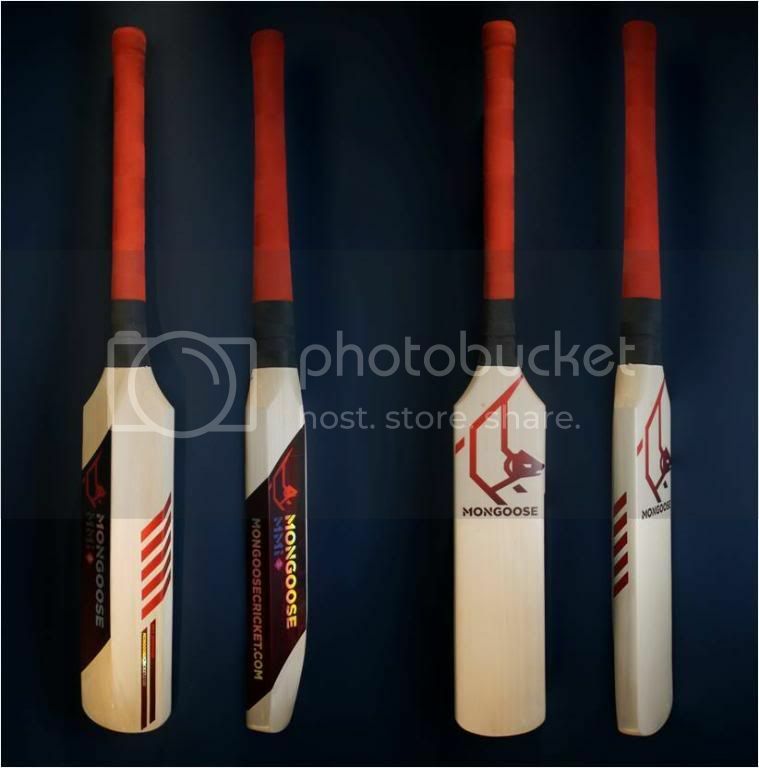 Their Product Mongoose MMI3 is the bat which has caused thunder in the world of cricket very recently. How is it different from a normal bat? If you've seen the pics you'll already know that. Its got a longer grip and a shorter blade. Which is just opposite to the normal bat! At this point you'll be asking yourself "How on Earth does that improve the batting experience? At the end its upto the batsmen, right?" THe Mongoose MMI3 has got no dead spot and most importantly the whole of the blade is the Sweet Spot. You can hit from any part of the bat, the ball for a mighty six. Er...What about the bottom? The bowlers can still bowl yorkers and put a halt to this bat? Thats what the bowlers did when the batsmen used normal bats. With the Mongoose coming into commercial cricket you would know how foolish is it to bowl in that area now! The weight of the bat that was removed from the top is now given to its bottom. Quite Technical!, yes and also this creates the sweet spot and the end of the bat also. So the weight remains the same, no hassles to use it. And you have a very new way of attacking the yorkers. You would have found out that since the blade is small, bowling short pitched deliveries will give a sure shot result. Sure Shot result, yes, but not in the bowler's favor. The mongoose bat has been scientifically proven to provide 15% faster speed so the cuts, hooks and pulls you play on a short bowl can be hit better. And remember, if you play the short a little early then also the tip of the end of the bat can hit for the desired result! The inventor of the bat, Marcus Codrington-Fernadez says in an interview that the bat is specifically designed for 20-20 cricket. Yes, it's main purpose is that. But even if you play test cricket or 50 overs cricket with the Mongoose MMI3 you can easily defend the ball. No Problems. Where does the problem lie in the bat? What is wrong with this one? You'll be itching to know that. The problem is with the Habit. Yes, the Habit of using a normal bat. So I suggest never use the mongoose for the first time directly in a match. YOu will need atleast 21 days of practice before you can take it on the pitch. Why I say 21 days is because, it takes almost that much time to get into a habit. And if you are not in the habit of using it. You'll find the bat extremely fast. Extremely Small some times. And you'll rather be concentrating on that than the batting. I know how it would feel to the bowlers, but I would just say, "Come on guys you are the ones with the actual brains in the game, you can easily think of the way to get this so called perfect bat out!" I know most of you would be ready to go to the mongoose store to buy this one but wait listen to the price first! It's a whooping Rs. 17000! You would only want to shell that money if you are a professional won't you? And yes, like any other bat you can still make it with any wood for home purpose! Oh yes, A Did you know fact: The Mongoose MMI3 was introduced in May 2009 in English County. Hayden is not the first one to use it! Given below are two videos I would love to share they explain more about the bat in detail. 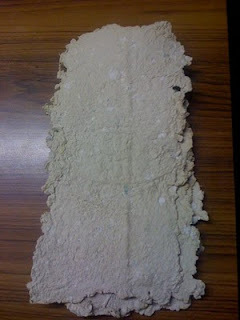 Many blogs, DIY websites, youtube videos etc.. would have given you special and tough tips about making a recycled Paper! But this most is the extremely easy. I'll give you a step by step guide to make the easiest DIY Recycled Paper in your Backyard. You might require the Recycled Paper as a school project or any other reason. This step by step guide works irrespective of that. You may choose a pile of newspapers, Bundle of old School papers, Practice sheets or a mixture of them! Its all up to you. TIP: Choose low quantity of waste paper (15-20 Sheets of paper are enough) . Don't create a pile of waste. Step 2. Making the Pulp! You can choose a blender for this one if you wish, but if you're not allowed to do that, you can simply show some muscle power and use a mortar and pestle to make the pulp. Tear the waste paper into bits and put it in a mortar and pestle or a blender with some water. Blend the mixture till it gets homogeneous. Take the pulp and put it in a tub of water for 2 days. Tip: The tub should be able to fit your sieve in it completely. Don't add too much water, just a quarter of tub should be fine. Patience is the key here, Don't disturb the pulp before 2 days. The mixture might stink, I suggest use a black polythene to cover the tub and also spray some perfume or deodorant if you prefer. 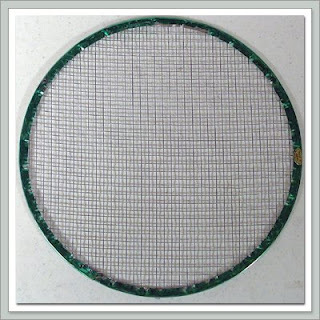 You can easily find a round sieve @ your house. However, a rectangular sieve is quite preferable. You need to buy one if you don't have it. There is no other alternative! TIP: The video below gives the directions to create a sieve yourself but use them only if nothing else is available (quite hard to make it!). DO NOT use a circular sieve with a large brim, it will never solve our purpose! Now comes the time when you need to move out of your backyard to a sunny place. But before that take your soil sieve and cut out a plastic sheet that covers the soil sieve properly. Take all the equipment out in the sun and place the sieve inside the tub. After a few moments take the sieve out. You'll notice the pulp on the sieve. Take your plastic sheet and drain the water out of it in the tub. When you're sure that there is not much extra water. Take the plastic of and place the sieve, carefully upside down on the table. Press the sieve a little and then remove it. Repeat step 5 for more paper. TIP: If you are using a circular sieve you can give shape to your paper by cutting the edges by a butter knife. Also for a larger paper you can overlap the pulp of two takes to make one paper and then fine it with cutting the edges. Water should be drained out as much as possible. The video below says that you need to carefully take of the paper from the sieve but I don't advice that, it is much more difficult. You can also refer to the video below! I mentioned about the Indian mystery movies in my last post, you know whats going to happen in the end. This one is yet another mystery movie, and you tend to catch up with this one if not knowing fully what's next. Plot: Karthik is bullied by everyone in his office from his boss to the peon even in his apartment his land lord doesn't leave him. He has no self respect. And then he starts receiving calls which say that they're by him... Karthik's Now Calling Karthik. And the rest should not be disclosed if you wish to enjoy the movie. Most of you must have thought it to be a Mystery and full of suspense film from the trailers. However, it is not. The first half of the movie just scrolls on how you need to know the 7 Habits of highly effective people! Nothing much really. But at the same time, inspiring. However, in the second half things change. It gets into the actual flow of a mystery. You no longer believe he has hallucinations (as in many other recent movies) and start finding who is the caller. You even suspect the Credit Card walas who call him! However, you don't need much brains to solve this one. Most of the times you also catch up with the movie. The climax, is simply average! It is a mixture of a few old movies and new ones. One's you're taken aback by that and ready to go out of the hall comes the writer's bit. Which by the way gives a little shape to this climax. The climax is just fine, not very good but at least better than some of the past suspense and mystery films or more logical than them of course. The film is not flawless, it has few loopholes. The script though well written and gripping is average when it comes to providing a good mystery. That's it not anything very bad about it. On the whole, Karthik Calling Karthik works because of its acting and a fairly good script. Though the movie is very good it never goes above that, you rarely say, "Wow, I never thought of that" or "Completely Ingenious" but still its a good entertainer and also behind all of that inspiring, to the "YES MEN"!